Strains with Beta-Caryophyllene include ACDC, Banana Kush, Durban Poison, Granddaddy Purple, OG Kush and Trainwreck. Beta-caryophyllene is a sesquiterpene. It is a unique terpene due to its large size and structure. 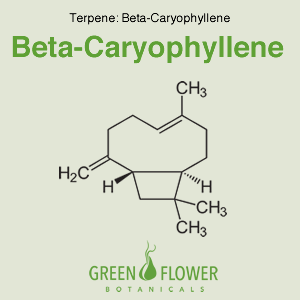 Due to these properties, beta-caryophyllene is able to activate several receptors in the body, including CB2, which is usually activated most by CBD. Beta-caryophyllene has been shown to be an effective analgesic by regulating neuroinflammation and thermal hyperalgesia. Also as an antioxidant, beta-caryophyllene is effective as demonstrated by preventing lipid oxidation and scavenging other radicals. As and anti-inflammatory beta-caryophyllene has been proven to mediate kidney inflammation and its side effects. In addition, beta-caryophyllene has been eluted to be a gastric-protective. The analgesic effects of beta-caryophyllene were evaluated in the rabbit conjunctival reflex test and in a rat phrenic nerve-hemidiaphragm preparation. Beta-caryophyllene attenuated thermal hyperalgesia and mechanical allodynia, and reduced spinal neuroinflammation. Also there were no signs of tolerance to the anti-hyperalgesic effects of BCP after prolonged treatment. Beta-caryophyllene was demonstrated to have a high inhibitory capacity on lipid peroxidation and showed high scavenging activities against hydroxyl radicals and the superoxide anion. In kidney cells, beta- caryophyllene successfully ameliorated cisplatin-induced kidney dysfunction, morphological damage, and renal inflammatory response. The effect of the compound was also correlated to mitigate oxidative and nitrative stress. Caryophyllene was indicated to significantly inhibit gastric mucosal injuries induced by necrotizing agents, yet barely affects the secretion of gastric acid and pepsin. Caryophyllene produced anti-inflammatory effects, without indication of gastric mucosal damage typical of non-steroidal anti-inflammatory agents like aspirin and ibuprofen.